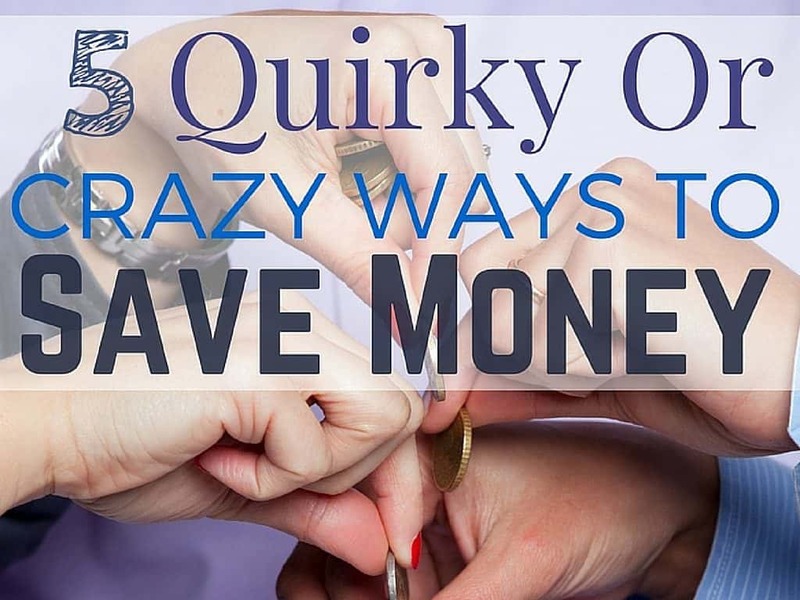 Crazy ways to make money. Most of you probably think that it is impossible to earn money online and make a living from it, but there are many people out there who regularly improve their budget from the comfort of their home. There are many fast earning online jobs can help you fix all of your financial problems. It is true that some online jobs require hard work and dedication, but once you check your bank account, you will realise it was worth it. Here is the list of 5 ways of earning quick money online. PTC or paid to click jobs do not require experience or special skills. Basically, you make money and improve your budget by clicking or watching ads and videos. Another excellent way of earning extra cash is to look for paid surveys. All you need is to be able to read and understand English. Believe it or not, you can even make money by sharing your opinions! Did you know that you can be paid for sharing videos, links or photos on social media? These tasks are called paid social media jobs. If you’re a talented writer and want to express your thoughts and show the world your creativity, a bunch of freelance writing tasks is waiting for you. Blogging is also a great way of earning money. There are many websites willing to pay for creating blog entries. If writing is your passion, give it a go, and maybe one day you can turn it into a profitable business. Finally, fast earning online jobs that appear on your news feed are not always legitimate. Check the website or the employer before you start working. Paypal broke away from e-bay last year and has continued as a separate entity. This journey for Paypal has been sweet and sour. The brand that it commands means the market share is still intact in spite of competition increasing. It still commands respect among the global community for its transparent process. Meanwhile, Paypal is reducing the operating systems that it uses, and limiting its operations in some countries. This is being done to consolidate the system towards a mobile based platform. The strategists at this online wallet company are aware that smartphones are going to rule the internet instead of computers in the future. One more area the company is delving into is providing financial data. Paydiant a system at retailers which is a Paypal’s idea that will make shopping cashless. The new CEO has focussed on both retailers and consumers, in order to maximise the potential of online payment. The recent development has been the tie-up with Apple Pay which is the forerunner of digital payment revolution. The path ahead looks really sunny for Paypal. Making money is essential for living. Today I will talk about some crazy ways to make money. (1) Professional Mourner – Death is the ultimate truth of life, and mourning is a part of it. Did you know that people make money out of mourning? Well, this is a popular profession in Africa and now it’s even spreading to Europe and America. (2) Collecting Cans and Bottles from Parties – Parties are going on everywhere, but the empty cans and bottles have to be dumped. Recycling these items can be a way to make money. (3) A Hangover Helper – Partying leaves many people with a hangover, and it is really difficult to make breakfast the next day. The hangover helpers bring breakfast and sports drinks to replace fluids lost while drinking and that too is for a nominal fee. (4) Selling Hair – This is another way to make money. You can sell your hair online! (5) Sleeping – Yes, there are jobs that pay for sleeping. Five-star hotels employ people to test their beds and rooms for sleeping comfort. You can do it periodically and the pay is good. Please tell me if you know more crazy ways to make money. Saving is supposed to be hard as you have to stop spending on whatever you want. That is what you all think, but it is not so. You can enjoy buy what you like and still save much for the future. Here is a three-step plan which will make saving much easier. Step 1 : Understanding cash flow – The very first step is to understand how cash comes and goes out from your account. This is called studying the income and expenditure patterns. This will help understand your behaviour with the expenses. You can also concentrate on earning more. That is what I did. I started writing part-time as freelancer and that brings in the extra money for the saving. Step 2: Decide your spending in advance – I am not saying that you should not spend when you like. I am an impulsive buyer and do that. But deciding the spending before going for shopping will help you to spend wisely. Lists help the most. Here are some tips to stop impulse buying in this article. Step 3: Limit monthly bills and Increase fixed saving – You can be careful with electricity, travelling and eating out. Also fix what you will save monthly. This will leave much in you hand and you can go for a holiday once a year! Turkey here I come (I hope). We all want to go for a holiday somewhere we can relax and just have a good time. Holidays are in fact recommended by doctors as a way of rejuvenating our bodies and give it a rest. If you are on a budget, the best time to go for a holiday is during the off peak season. You need to find out what is the off peak season for the destination you desire to go. Last year at this time I booked to go to Greece which was a reasonably good holiday and I am thinking about going somewhere else this year, thought I would share some things that I will be thinking about when I plan. Off peak season is when very few people go for holiday or visit a particular holiday destination. The beauty of going during off peak season is that almost everything is at discounted prices as compared to peak season. Some airlines have off peak season ticket prices which are cheaper than the peak season. You are sure of getting a ticket since there are very few people flying. 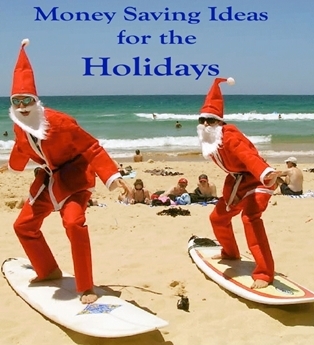 Since there are few holiday makers visiting a particular destination, tourist related business offer discounted prices. Hotels and restaurant will be competing for the few customers hence price reduction. You are sure of getting the best cheapest accommodation. You get to enjoy without any hustle. Peak season mean crowded beaches, transport system etc. In off peak season, you get few people and less crowded places like museums, zoos, national parks etc. So its looks as if it well be an off season holiday for me and I am thinking Turkey as friends went last year and the weather in October was glorious. So starting to search it out, let you know more next time. Plan and rent an apartment – Hotels are places of luxury and should be enjoyed. Well folks I do not think so. Hotels will not let you experience the culture up close. Try out renting an apartment on your next holiday and you will know what I am trying to say. Saving is a natural outcome as apartments are much more economic. Try and cook your own food – Once you have an apartment for the holidays, you can cook at home. This has many benefits. You will be healthier and would enjoy the vacation and saving will be there as you would not be eating out. Carry your own water – The apartment will invariably have a water purifier. Carry a reusable bottle and avoid buying bottled water. You are saving money and also helping the environment. These are unconventional ways but save you so much money that you will be really amazed. Having cash issues when on vacation is a no go. Short term loans can help you solve you immediate cash issues. Ferratum has the easiest process of getting such loans. You can repay when you come back. It is very easy! Once upon a time there was a young man in a village. That young man had only one problem. He was jobless. One fine day he was going around the village looking for a job. At the edge of the forest he saw a timber camp. He approached the boss of the timber camp looking for a job. When he looked at the muscles of the young man, the boss was overjoyed and said “Boy from today onwards wood-cutting job is yours”. The young man was very excited. He immediately went to the forest to cut trees. Day 1 – He worked from morning till evening with tremendous zeal and enthusiasm. By the end of the day he was able to cut eight huge trees. Day 2 – Again the young man went to the forest, worked from morning till evening with tremendous zeal and enthusiasm. By the end of the day he was able to cut seven huge trees. Day 3 – Same span of time, same zeal and enthusiasm, same axe and he was able to cut only six trees. Day 4 – His performance went further down and he was able to cut only five trees. On the eighth day of the employment when the boss of the timber camp was going around supervising the work, he saw this young man. He was unable to cut a single tree. From morning the young man was busy wiping his sweat. The boss was bit concerned. He called – “Hey boy come here. Why is your performance is going down day by day”? 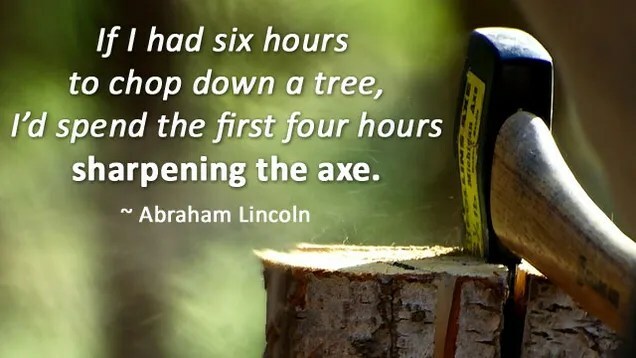 The young man said – “Sir, I have been working for the same span of time in the same forest with the same axe you gave me, but I don’t know why my performance is going down”. Boss was a very wise man. He listened to what the young man had to say and then asked – “Boy tell me something. Have you taken some time out of your schedule to sharpen your axe”? Young man said – “Sir, I was very busy cutting the trees; I never did anything of such kind”. Now the boss looked deep into the eyes of the young man and said – “Young man, listen to me carefully. It is not that very important to work hard in life, but very important to work sharp in life. I repeat it is not that very important to work hard in life but very important to work sharp in life. Similarly we might know many people around us who will be managing a business, who will be running a business, who might own a business. They work for eight hours a day, ten hours a day, sometimes twelve to fourteen hours a day. They will work for Five days, six days and sometimes seven days of the whole week. But still at the end of the month they will be struggling to pay the bills. They will be following the same routine day in and day out, over and over again, at the cost of their personal time, at the cost of their family time and the worst part is at the cost of their health. And every time they say they are busy and they are working hard. On the other hand we might know few business people, most of the time we call them as smart business people. They will work six to eight hours a day, three to five days a week and they seem to be making more profit and money compared to busy and hard-working people. And on top of that they have time to look in to what is happening in their business. They have time for their family. They have time for their hobbies. Friends the question is not what business these smart business owners are doing. The question is what is that they are doing different as compared to busy hard-working people.